In the third and final part of Yitzha (Icha) Sarwono’s guest blog post, she will show us how she uses teaching booths as part of her unplugged Montessori teaching. You can read part one here and part two here. Vegetables muscle work: I prepared carrots, tomatoes, cucumber and long beans. They can choose between grating the carrot, slicing the cucumber, cutting the tomatoes or long beans. I did however pay very close attention when they were using the knife as I had to make sure they didn’t hurt themselves. They loved this booth so much that each one couldn’t wait for their friend to finish their turn. Logic booth: Here I asked them to sort between red beans, soya beans, and green beans. They had to group the beans in a small bowl, then paste some of it on a worksheet that I have prepared for them based on the group. Though not all like the pasting part, they sure enjoyed the sorting time. Grammar booth: As I was aiming for them to learn more about singular and plural, I laid down the vegetables in singular and plural form and then asked them to do the same. 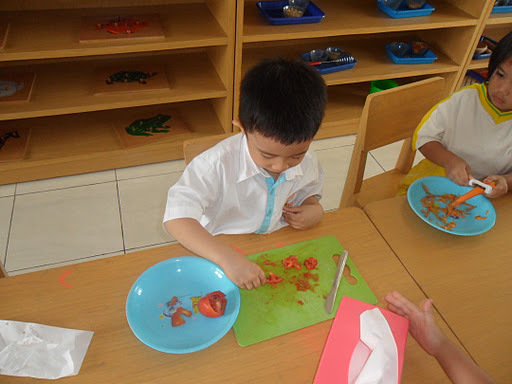 Though they still had difficulties with the vocabulary but since they knew the first letter of each word, they could match each vegetable with their writing. Culture lesson: I asked them to place the fresh vegetables aside the picture of a cooking where they have to match them; carrot in a picture of soup, long beans in a picture of gado-gado (traditional Indonesian salad), potato in a picture of mashed potatoes and spinach in a picture of a sauté spinach. Math: aside from addition I was also repeating the last lesson which is ‘less’ by asking them to put less vegetables in the provided mat next to their pair which was the same type of vegetables but with ‘more’ numbers than the one they had to complete. Cooking booth: as my goal was to get them to eat vegetables, I set up a cooking booth where we made mashed potatoes and baked broccoli with cheese. They helped me mashed the steamed potatoes and mix them with milk, cheese (lots of cheese! 😀 ), butter, spices like oregano, salt, and pepper and also a secret ingredient which was a mix of pureé broccoli and spinach! Thanks to the huge amount of cheese, the mashed potatoes were a hit! I did baked broccoli with cheese too, but of course as they could see the greens under the cheese, not too many of them would love to eat them all up, they usually just gulped down the cheese and left the curly broccoli alone. Well, I can’t say that this has changed the way they see the greens, as they still consider them to be an alien, but during this lesson I do hope I can let them to at least learn to get to know them better. A big thank you to Icha for sharing her experiences with us. Make sure you read her blog and follow her on Twitter too. love the “vegetables muscle work”. Something bout it makes me smile (being a cook and mostly vegetarian). Yer kids are a lucky group. My lil' sis teaches at a montessori school too and loves it. I chose to try the dogme teaching for this theme cause I want them to like the greens as much as I do. Big hugs to your teacher please? Thanks Icha! I have done ELT with children for many years in different places, and I love your ideas. Tomorrow I'm going to visit a local bilingual Montessori school and I'm curious to see how their ideas measure up to yours.